Before I get to anything else, I want to tell you about an interview that the law blog Abnormal Use did with Mark Waid earlier today, with a particular focus on Matt’s job as a lawyer. The interview also contains spoilers for Daredevil #4 which is due out in stores tomorrow, though these are clearly marked and easy to avoid. 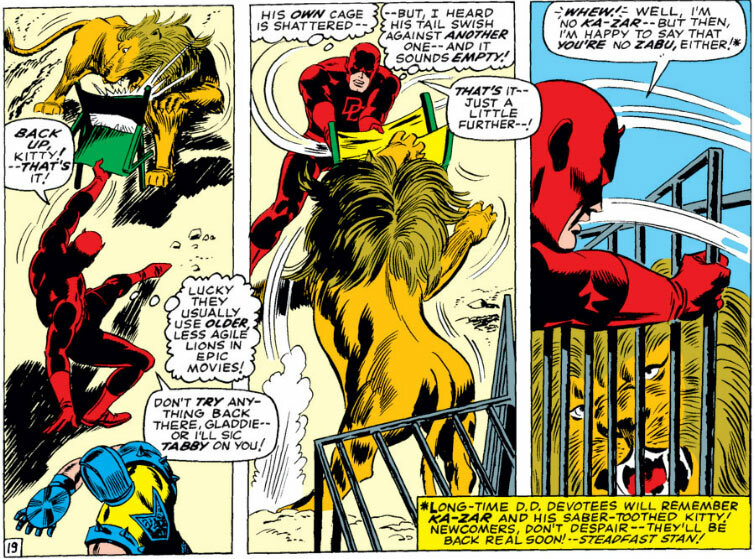 The issue in which Daredevil meets Ka-Zar and is carried off on the back of his kitty. This is going to sound weird, but I think early Daredevil has a real knack for looking like an adorable little rag doll while unconscious. 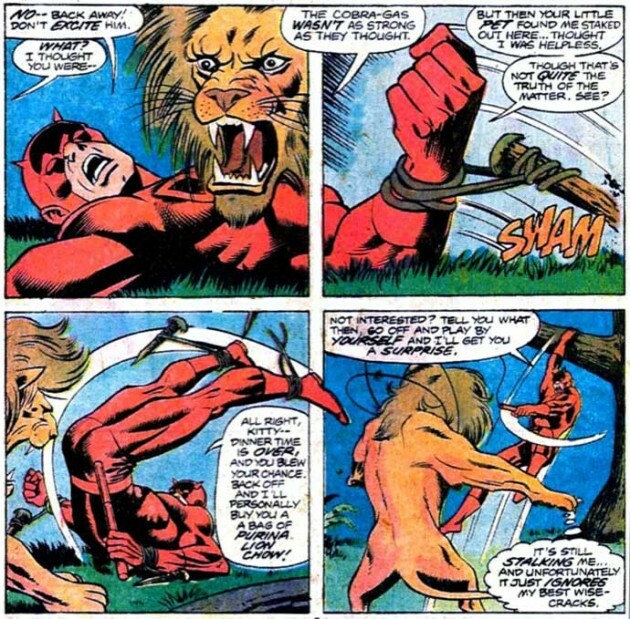 The issue which sees Daredevil battle the Gladiator and the Masked Marauder (also known as the world’s creepiest landlord) while beating up a lion with what looks like a lawn chair. 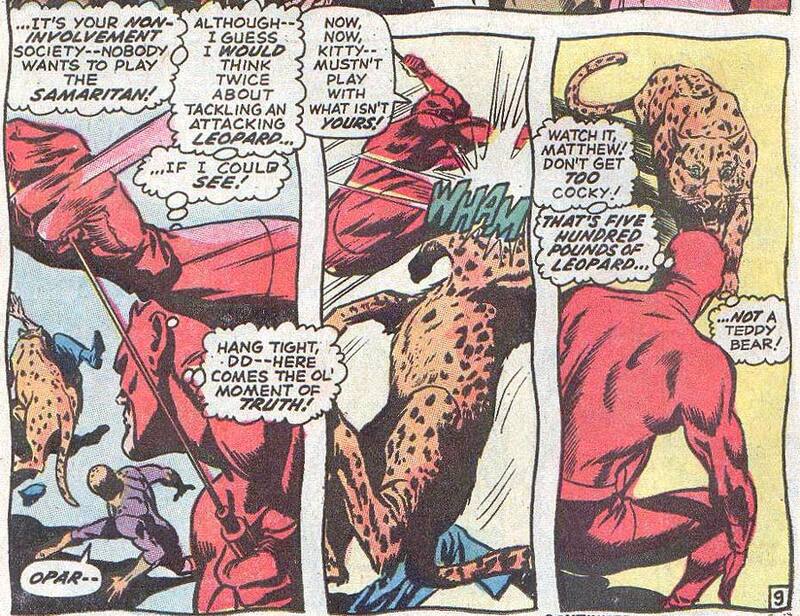 The really strange issue in which Matt first battles, then befriends, the blind Tagak, who telepathically uses the eyes of his jaguar to see. Unrelated, but this issue also sees Matt smash a mirror, thus strengthening the otherwise superstitious notion that doing so causes a bad and prolonged case of bad luck. The issue which sees Daredevil fight alongside Shanna the She-Devil and her large furry companions. Curiously, Shanna spends the entire issue wearing a barely there lace night gown. By her standards, this means she’s covering up much more than usual. The issue which sees Matt Murdock marvel at Ed Brubaker’s decision to make The Matador a legacy villain (and one who is made only marginally cooler by also being able to fight lions). Okay! I hope you all had fun making this little journey through the archives with me. I will see you when it’s time to post my Daredevil #4 review. You are not the first person to think that early Daredevil makes an adorable ragdoll. Maybe that’s why he got knocked out so much in those days … that, or Stan Lee was just out of segues. I don’t remember that seen from DD 89. I assume that was when he went to Europe to find “Foggy’s killer.” I love this post. What great moments in DD history. 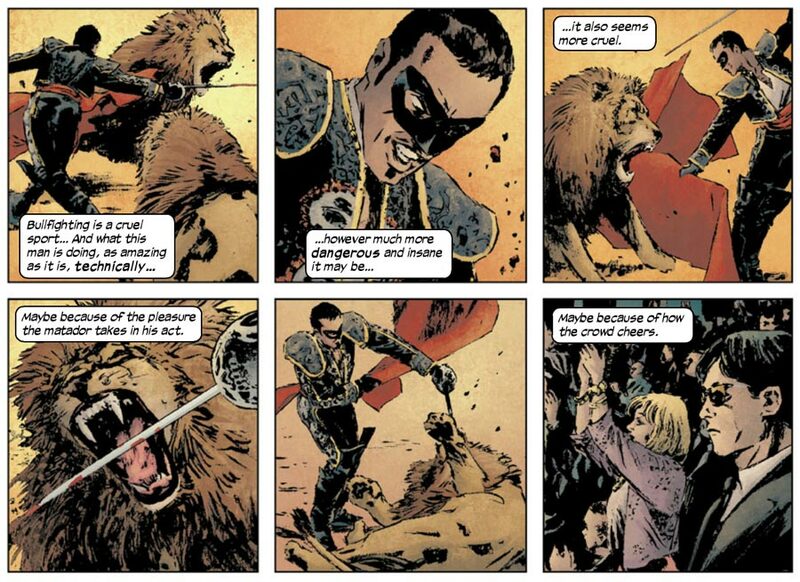 He also got trapped in a tiger pit in issue Vol 1. #212. Fairly similar to Vol 3. Issue #4.